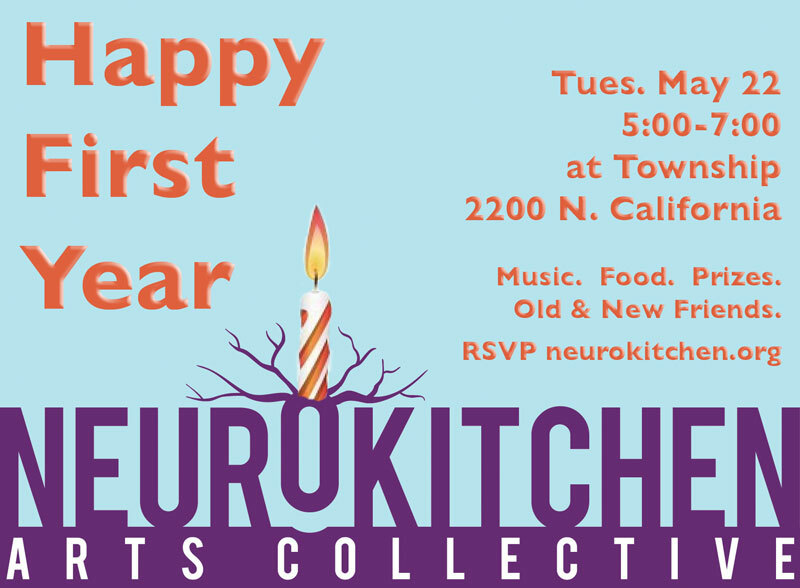 Send NeuroKitchen into Year Two with Gusto! A year ago our collective came together propelled by uncertainty and inspired to create anew. We had nothing more than our ideas, hopes, and support of each other and friends. These are still our most treasured assets. To those we can add our accomplishments of the year. We can see the sprouting of the seeds we planted and cared for since our unveiling event in May of last year. offered a six week Curiosity Club summer camp for kids at the Prop Thtr and a full-day winter club at the Wicker Park Art Center. working with an externship program at the John Marshal School of Law to file for our 501(c)3 tax exempt status. performed at the opening of the city's Cultural Planning session in Wicker Park and participated in discussions about spaces, sustainability and arts education that will help to shape the next 20 years of culture in Chicago. all the while we have been meeting as an ensemble, creating new performance material, discussing grants and dreaming of our next big ideas. • Curiosity Club: summer daycamp for kids ages 8-11 to delve into art and science projects. Active bodies + Engaged minds = Happy kids.